Chicago is an experience everybody wants the opportunity to have. We visited the Planetarium first, it was interesting and about the same topic that I have in my history class. The moon, the planets and now I know that I am over 60 mercury years old. An interesting fact =D. 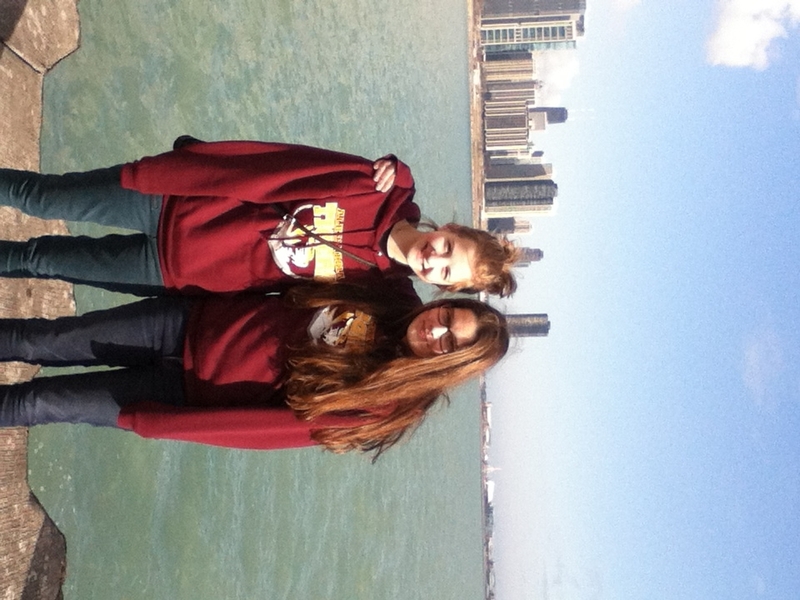 But before we did this, we took pictures in front of Lake Michigan and the Chicago skyline. After the Planetarium we visited the Aquarium and I think if I compare these two points, the Planetarium was more interesting and funny, because of the bad smell in the Aquarium. A lot of German students got a headache. In the evening we tried American Pizza and had a nice evening all together. But we students think that the bedtime was too early. On Sunday, we made the shopping tour every girl expected =) 4 hours of dreaming… It was the best thing we did this weekend I think. 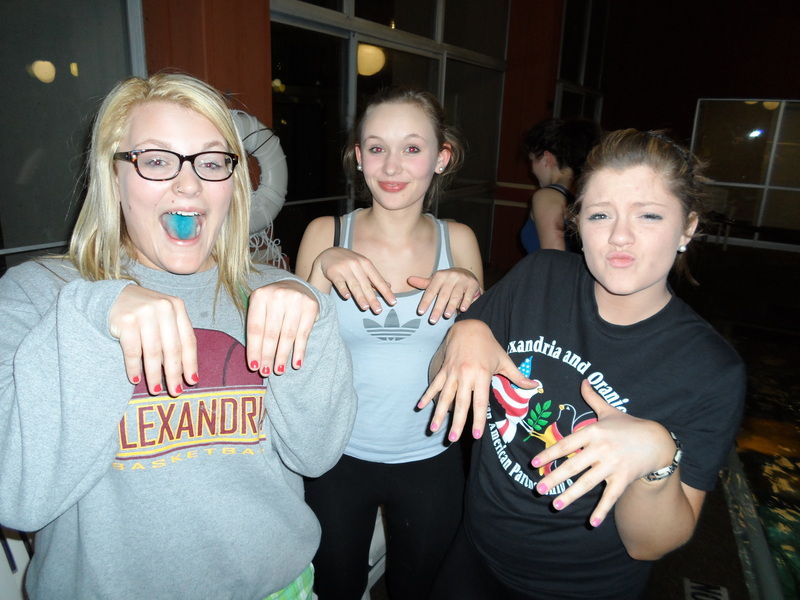 And our teachers wanted to see our new clothes so we had a little show in our hotel. About our hotel we had a little fitness room and a great pool. Everybody had something to do there. The best view over Chicago… We went to the highest skyscraper there and we could take photos. It is a circle in the 103th storey. I found that cool because of the glass where you can walk on. This trip was very cool and we did something for everybody. We had a lot of fun and we enjoyed our tour. The first sight we visited in Chicago was the „Adler Planetarium“ on Saturday. On the same day we were in the „Shedd Aquarium.“ Sunday, before we could go shopping, we had a Sights-Seeing-Tour. We received a lot of important information about the different skyscrapers & about the other buildings. The „Sears (Willis) Tower“ we visited on Monday. Unfortunately I’m afraid of heights, so I couldn’t enjoy the wonderful view on the Sky-deck so much. 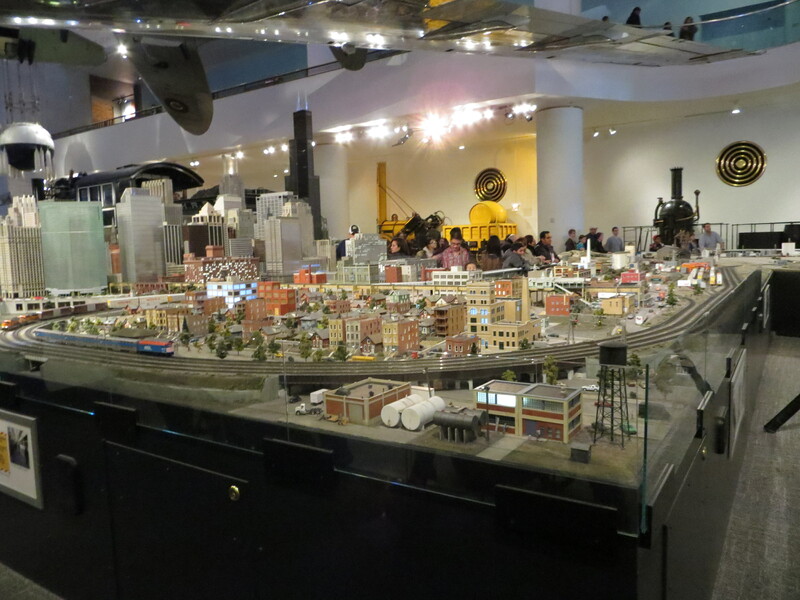 In my opinion the best was the „Museum of Science & Industry.“ We could see a lot of conditions & there were a lot of inventions I had never seen before. However it sometimes was a bit difficult to understand the experiments because of the English explication. I think the most interesting thing was that we could test most of the experiments. I wish we could spend more time in Chicago to view more sights particularly. (1) First impression getting into Chicago. (2) A great view on the skyline from the planetarium. (3) Everyone enjoying picture time. (4) Lisa and Elisabeth. / (1) Der erste Eindruck bei der Ankunft in Chicago. (2) Ein toller Blick auf die Skyline vom Planetarium aus. (3) Alle geniessen den Foto-Stopp. (4) Lisa und Elisabeth. From left to right: Chicaog skyline, our students taking in the beautiful view, the planetarium. Oh, and of course this is Lake Michigan. / Von links nach rechts: die Skyline von Chicago, unsere Schueler, wie sie den tollen Ausblick einsaugen, das Planetarium. Oh, un das ist natuerlich der Michigan See. On our first day in Chicago we went to the SHEDD Aquarium for 4 hours. After a while it got a bit boring because it was so long. But I think there were some interesting things, like the beluga whales. It was very impressive to see them. I like whales pretty much and I never saw real belugas before, so I was very happy to get that chance. Another special animal in the aquarium was the oldest aquarium fish in the world. He is a lungfish and his name is „grandpa“. 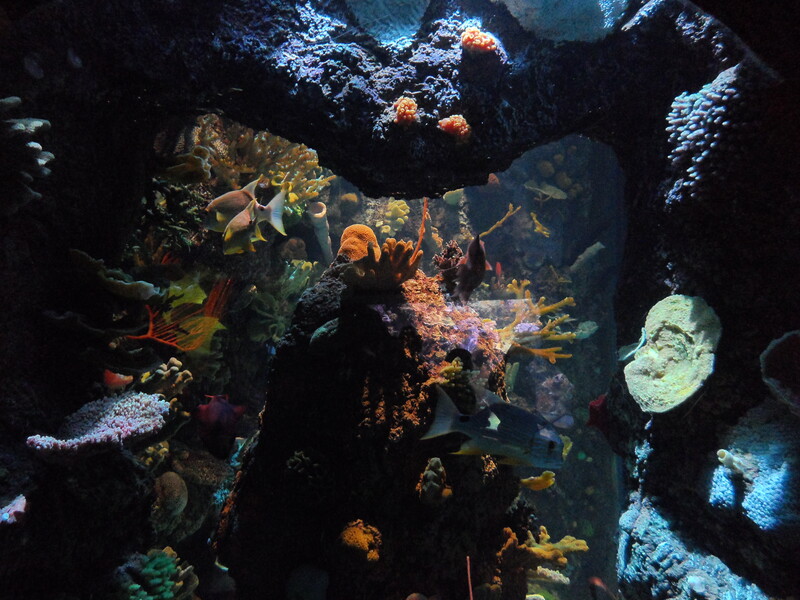 We were also in the “wild reef” where you could see sharks and other fish and parts of the wall and the ceiling were covered in corals. There I could take a lot of good pictures and I found an animal with a cool name. It was a nudibranch, that’s a sea slug. But I was happy when we left the aquarium too because I had a bit of a headache of the bad air. 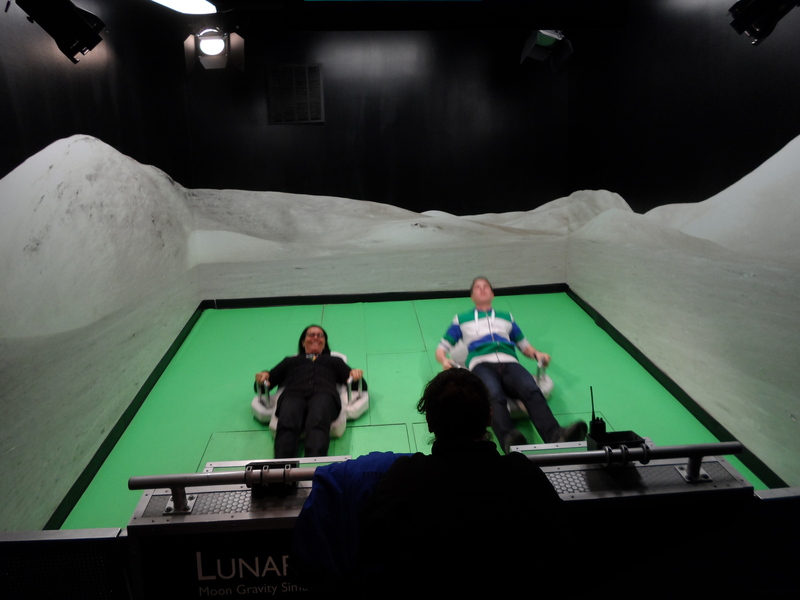 (1) Walking the moon… here you could actually see what it would feel like with less gravity. (2) Landing on the moon. 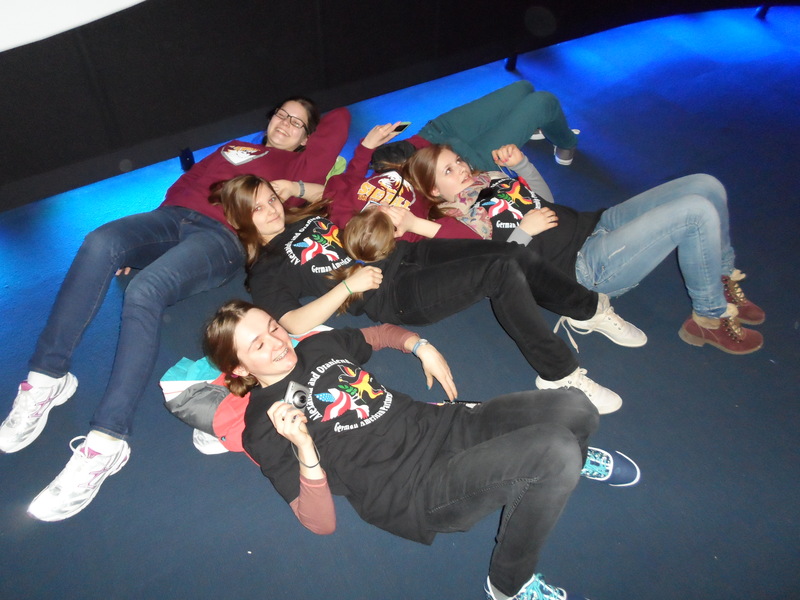 (3) Well, this is what some of the girls decided to do in the museum: look at the stars above, right? (4) The boys enjoying the terrasse. (5) Ragna. 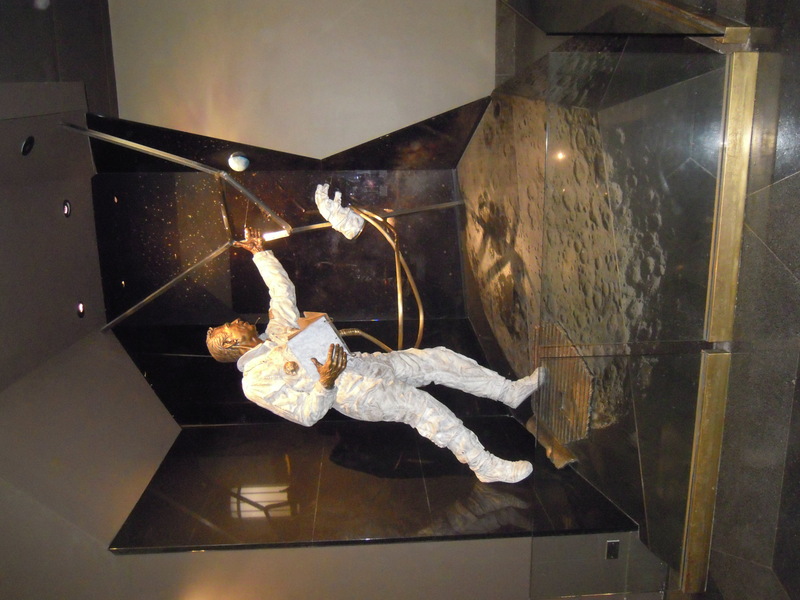 (6) The „real“ moon man. / (1) Den Mond begehen… hier konnte man tatsaechlich ausprobieren, wie es sich mit weniger Erd-(Mond-)anziehungskraft anfuehlen wuerde. (2) Eine Landung auf dem Mond. (3) Das ist es, was einige der Maedels im Museum taten: die Sterne oben beobachten, richtig? (4) Die Jungs geniessen die Terrasse. (5) Ragna. (6) Der „echte“ Mondmann. 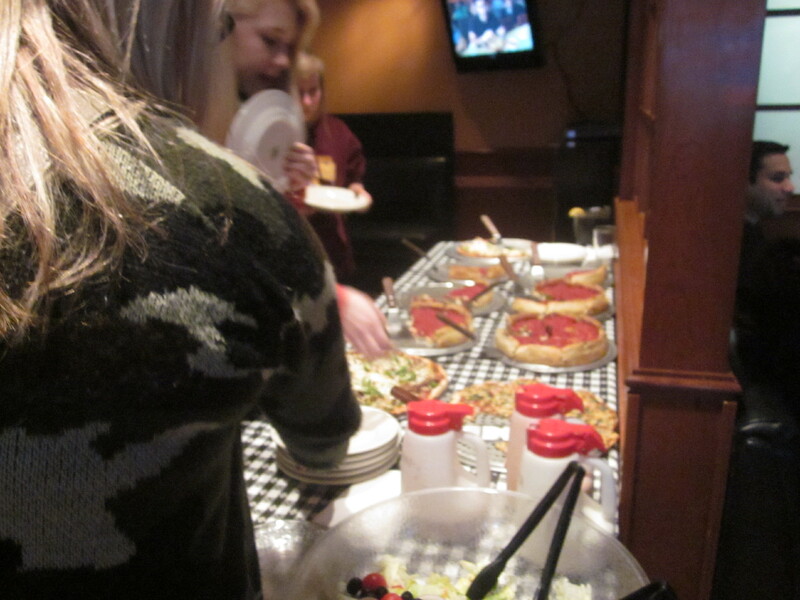 My favorite experience in Chicago was the dinner at Edwardo’s pizzeria. The deep-dish pizza was sooooooooooo delicious. I was surprised about how many layers those pizzas have. The deep-dish pizza is typical for Chicago. I liked the dinner at Edwardo’s pizzeria equally to the Skydeck of the Willis Tower. The reason why being on the Skydeck wasn’t my very favorite experience is that I was on the television tower in Berlin sometimes and that’s nearly the same height. (1) Hello America! 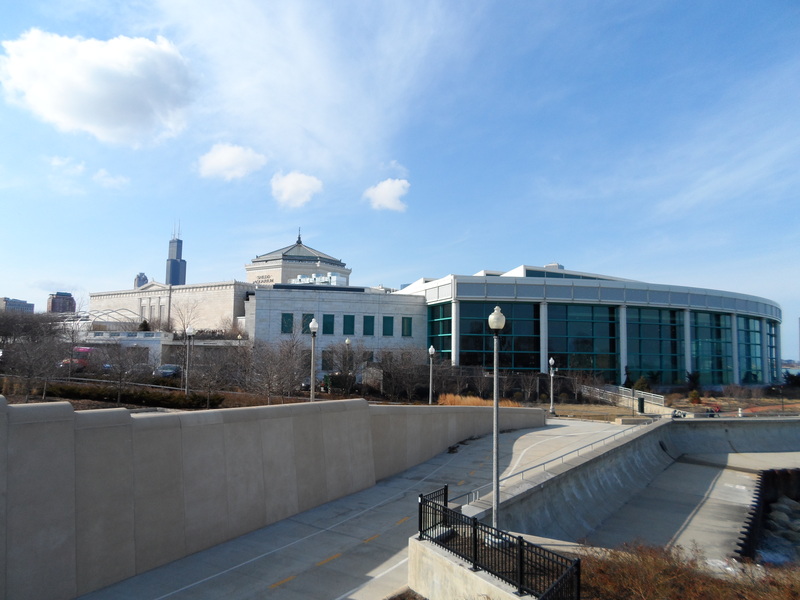 (2 + 3) The SHEDD-Aquarium. (4) Beautiful aquarium experience. 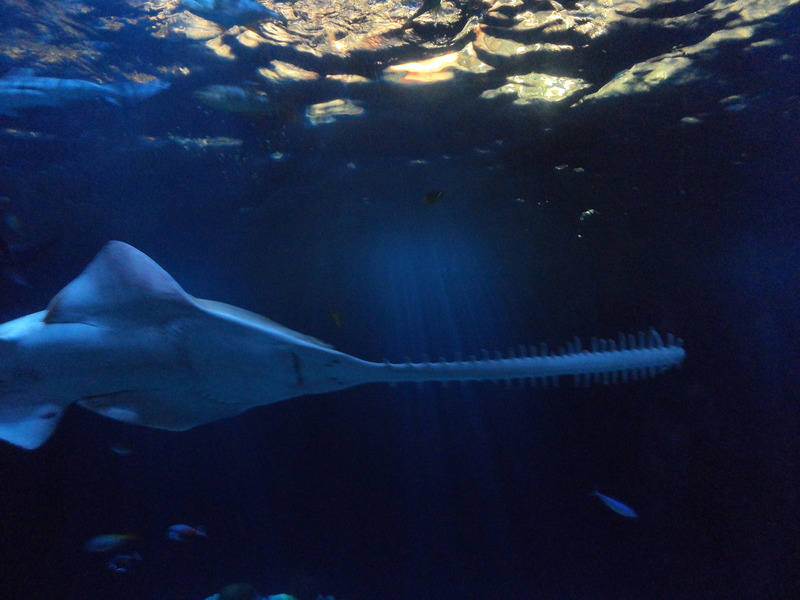 (5) The longest fish in the aquarium: a sawfish of 14 feet length. / (1) Hallo Amerika! 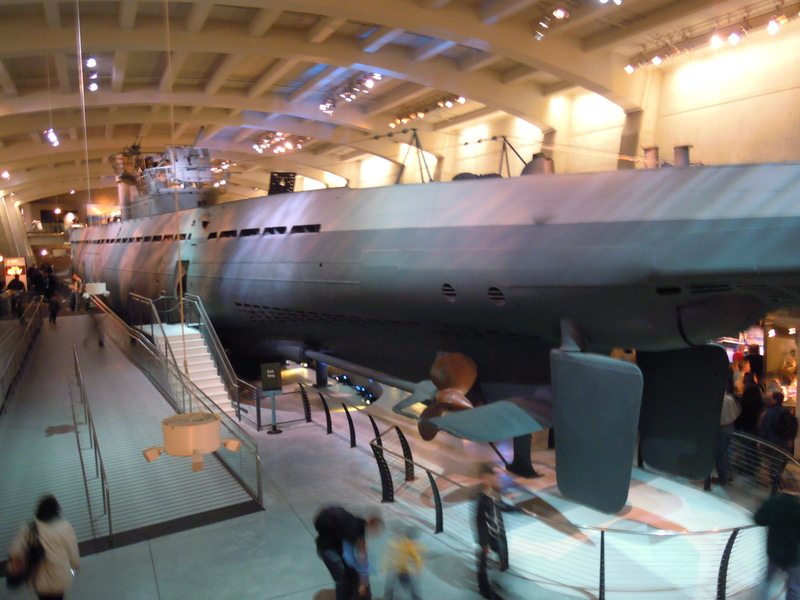 (2 + 3) Das SHEDD-Aquarium. (4) Wunderschoene Aquariumserfahrung. (5) Der laengste Fisch des Aquariums: ein Saegefisch von 4,3 Metern. On March the 23rd we met at 6 o’clock in front of the school. 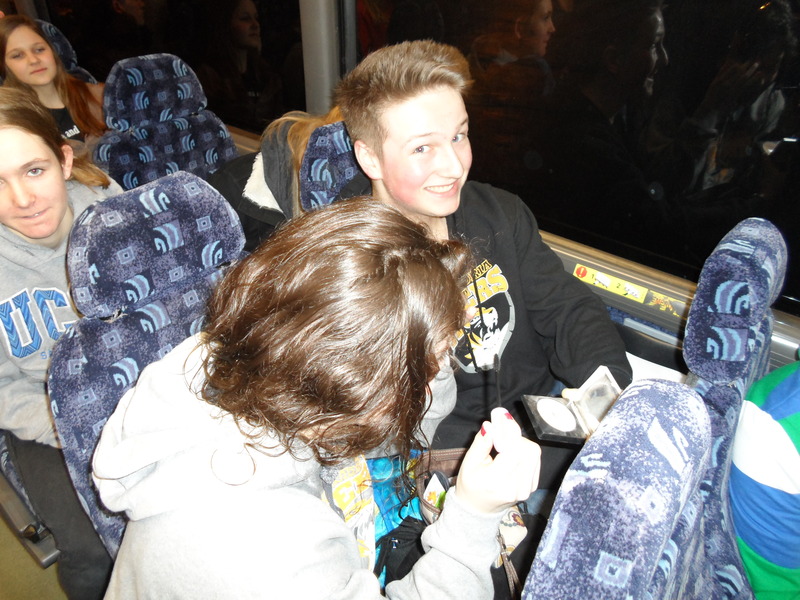 We rode the bus to Chicago. It was a great tour, because we all talked with each other. 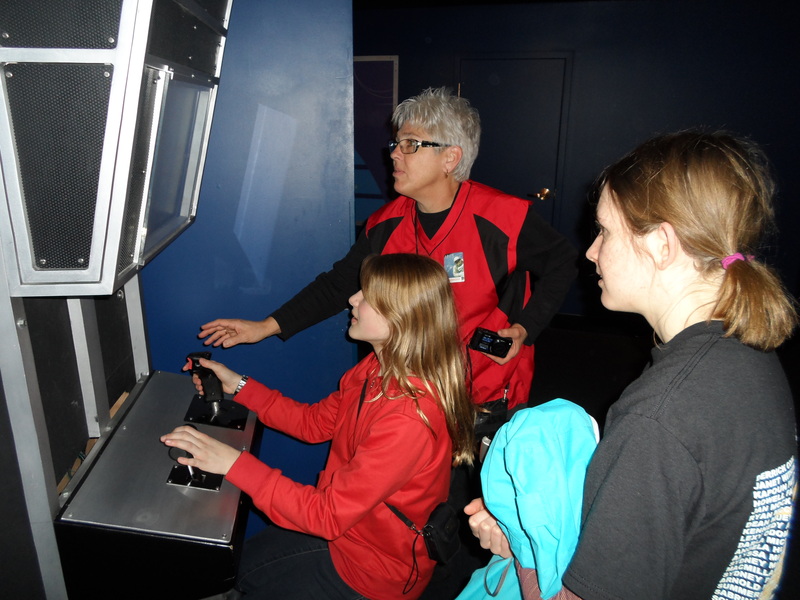 In Chicago, we went at first to the planetarium. After that, we went to the aquarium of Chicago. We saw many fish and sharks. I found, that the big fish are the coolest fish. The biggest special ones were the dolphins. Luzie and me saw a dolphin show and enjoyed it. After we visited the aquarium, we drove by bus to our hotel, which wasn’t very tall, like the other big skyscrapers in Chicago. In the hotel, I shared the room with Malte, Halan and Devin and we had our own door to the room of Tilman, Wil, Thomas and Janik. The other guys of the other room made a little party, after we’d had dinner in a Pizza-Restaurant. On the next day, we drove through the city with our guide. 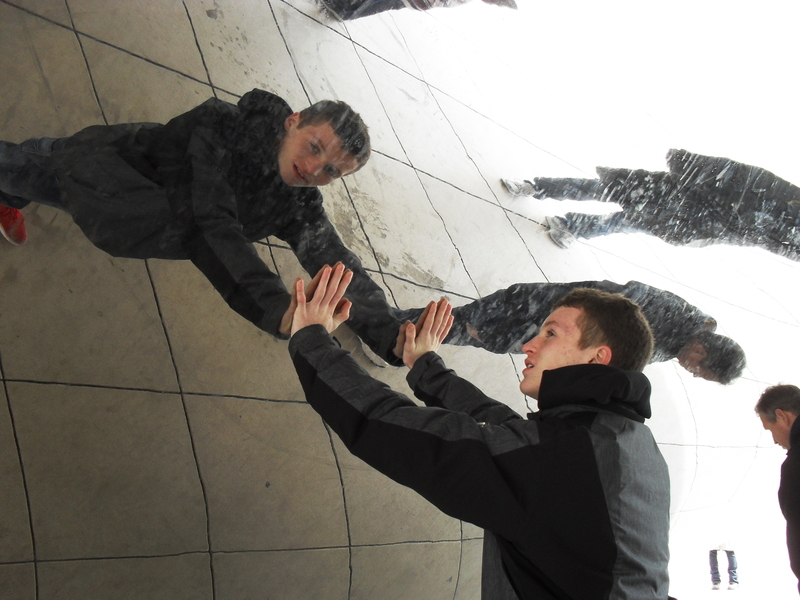 For example “the bean” (a big mirror-bean) was very cool. We took cool pictures and enjoyed the sun there, because it wasn’t a very sunny weekend. On the next day, we went to Willis tower, one of the tallest skyscrapers of the world. It has 103 storeys and you can see very much on the 103rd storey. We’ve spent there about 2 hours and after that we went to the museum of science and industry. The coolest thing there was for me the little twister. We went to the bus and drove home. Our host families waited there for us. Chicago was a very cool city. (1) The typical Chicago favorite: Deep-dish pizza. (2) At the Italian restaurant. / (1) Eines der typischen Gerichte aus Chicago: Pfannen-Pizza. At 4 a.m. the alarm clock was ringing. I really looked forward the Chicago trip, but in this moment I only thought: “I don’t want to get up!” My host sister went downstairs and got ready for the trip. I said to myself “Only 5 minutes you can close the eyes again.” In the end I slept about 50 minutes. 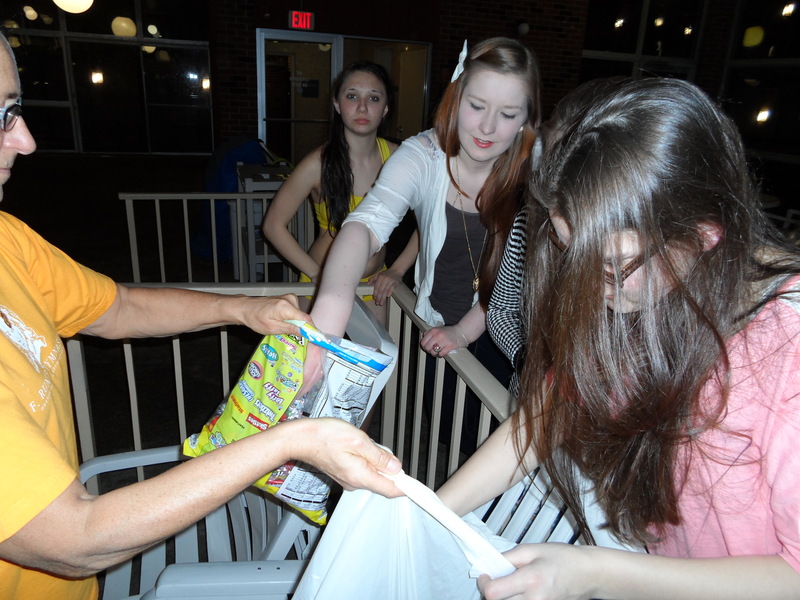 I was so glad that I packed my stuff the day before, so I only had to get ready and near upon 6 a.m. we drove to the bus. First, we all were very excited and wide awake, but after a little while we all felt in sleep. After 4 hours in the bus, we arrived in Chicago. Our first stop was the Adler Planetarium. But before we went inside, we had time to see the breathtaking skyline of Chicago. Of course we took many pictures. The planetarium was very interesting, especial because we could try many things by ourselves, for example jumping on the moon or landing a space shuttle. Furthermore I liked the architecture very much. Then we drove to the Shedd Aquarium, where we had a lot of time to see all things in clam. In the evening we went to the hotel, only put our luggage in our room and went to a pizza restaurant, where we got an original Chicago pizza. The special thing about this pizza is, that the vegetables or the meat are in the cheese and on it is the tomato sauce. Full of pizza we went again to the hotel and almost in the first moment we were there, the first guys were in the big pool. It was a lot of fun but later I only fell into my bed. And then the alarm clock rang again. Get up. After breakfast we made a sightseeing tour through Chicago. 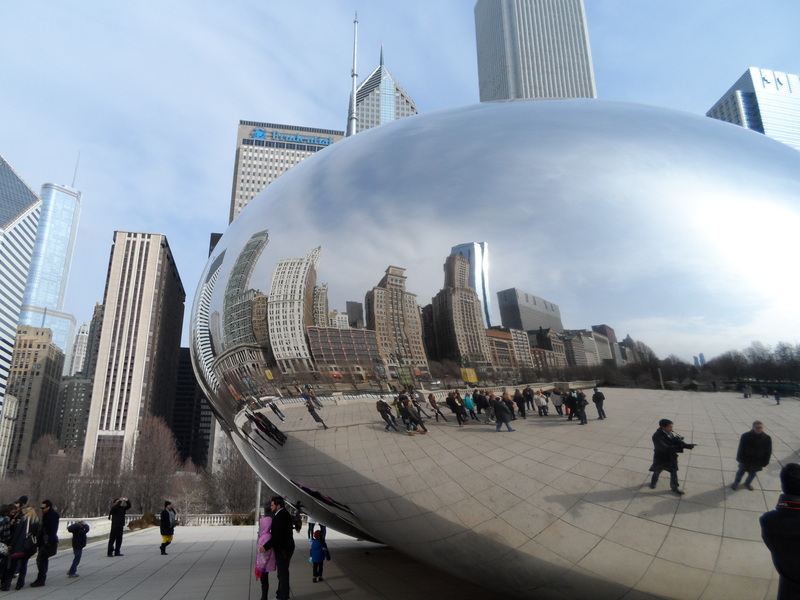 We saw the most famous sights there, like the Chicago Bean, in it you can see the a reflection from Chicago, the Navy Pier, with half an amusement park on it and Obamas private home, which is really guarded. Our tour was about 5 hours long and after it we had time for shopping (finally). We only had 4 hours in the huge mall and this wasn’t enough! But we had a lot of fun there and we even met other German people and one of the salesmen spoke German with us and told us that his grandma came from Germany. Consequently we drove to Greek Town for dinner. And how the name can tell you, there were a lot of Greek restaurants and also one Chinese one, called “Chinese Yum Yum”. We could choose one. We went only cause of the name to the Chinese restaurant. Then we all drove tired to the hotel. 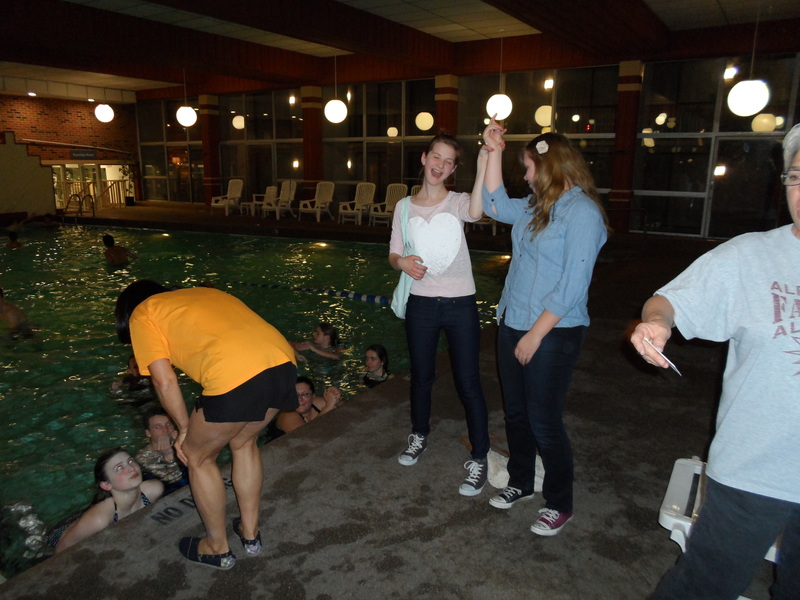 Most of us went in the pool again, the others had to make a fashion show with the clothes we bought in the mall. I was one of them and I just hobbled walkway, because I hurt my knee badly. Anyway it was a really good day. And as soon as I was in my bed I fell in sleep. The next day after breakfast we were packing our luggage and drove to the tallest building in Chicago, the Willis Tower. It is 1,730 feet tall. On the 103rd floor, in1, 353 feet is the famous Skydeck, with the glass box. From this place you can see complete Chicago. 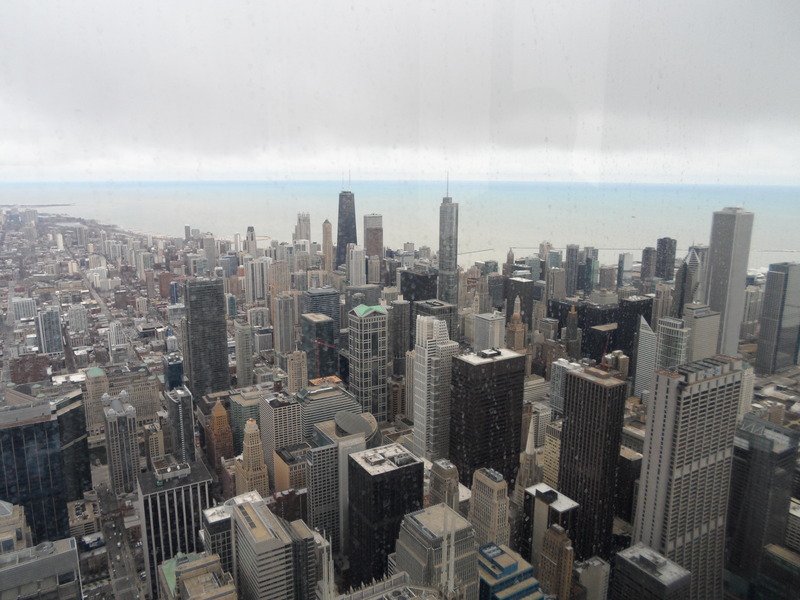 The weather wasn’t the best so we went after the Willis Tower to the Museum Of Science And Industry. The museum was very fascinating. I think you could spent there one day and don’t see all things but we only had about 2 hours. That was such a pity. After another hard day we went to the high school, where our host families were waiting for us. Chicago is one of the most beautiful cities, which I’d ever seen. (1) Enjoying the pool. 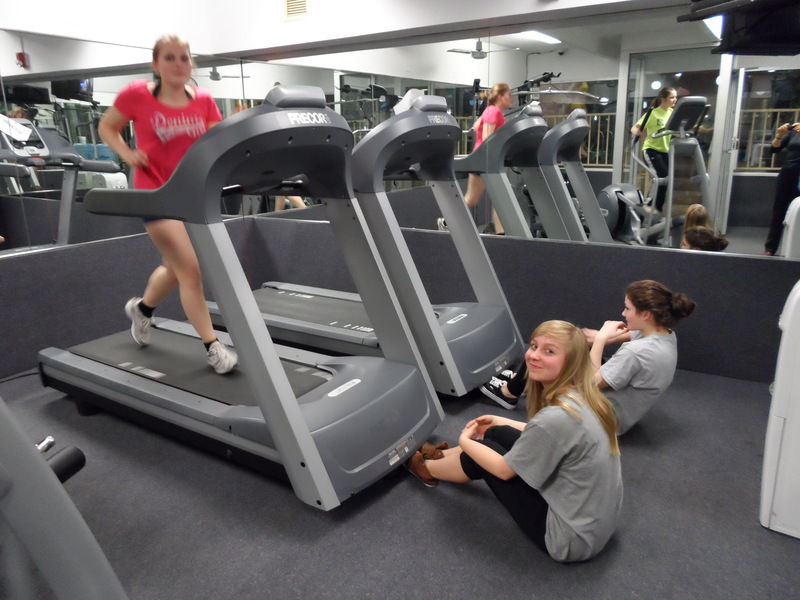 (2) Working out. 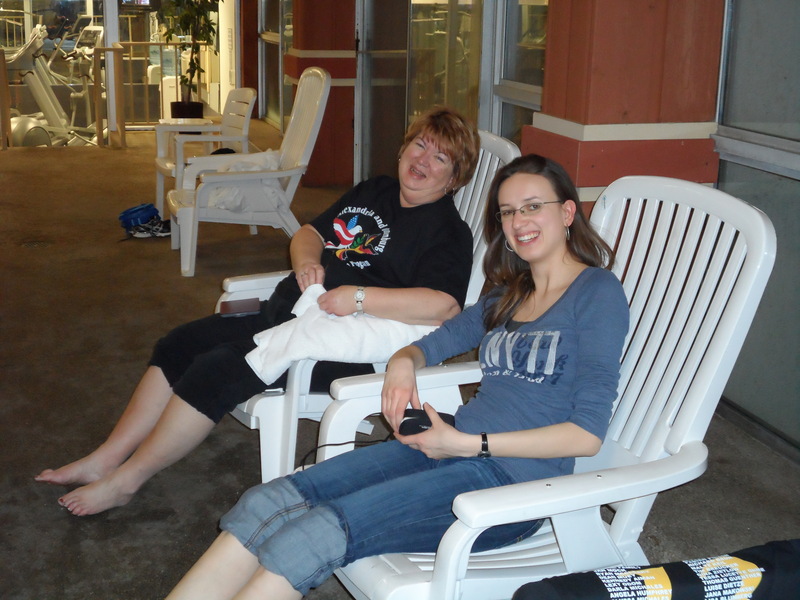 (3) Serena’s (Jana’s exchange student’s) grandma and Ms. Solik by the pool. 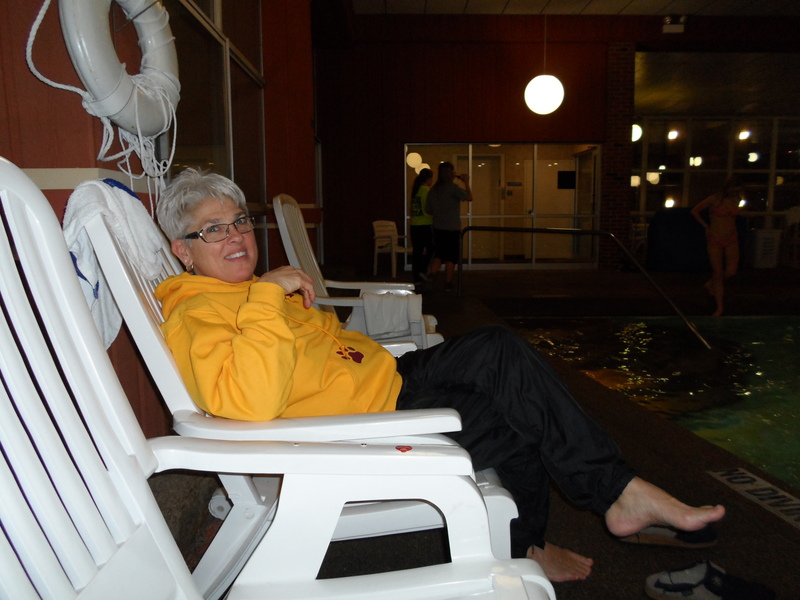 (4) Ms. Mock feeling like in the sauna – it was SO hot in there. 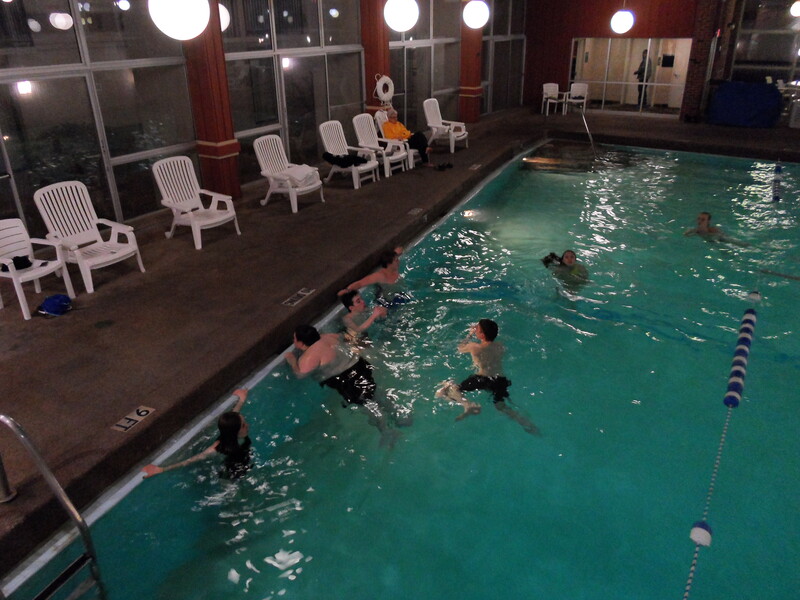 (5) Having fun in the hot tub. (6) Girls getting ready for their vacations: after getting their nails done. / (1) Den Pool geniessen. (2) Trainieren. (3) Serenas (Janas Austauschschuelerins) Oma und Frau Solik am Pool. (4) Frau Mock fuehlt sich wie in der Sauna – es war SO heiss dort drin. (5) Spass haben im Whirlpool. (6) Maedels, die sich fuer ihre Ferien bereit machen: nach der Manikuere. I was totally excited for Chicago! It sounds weird but the most amazing thing I looked forward to was the blue water! When we arrived we were right on the Michigan Lake and I was so overwhelmed, because I have never seen such a wonderful water before! I just like those landscapes and so I took many pictures of the lake and the skyline. The next day it was very windy and that’s why we could see so many waves and they shattered at the seaside, it was awesome to watch! 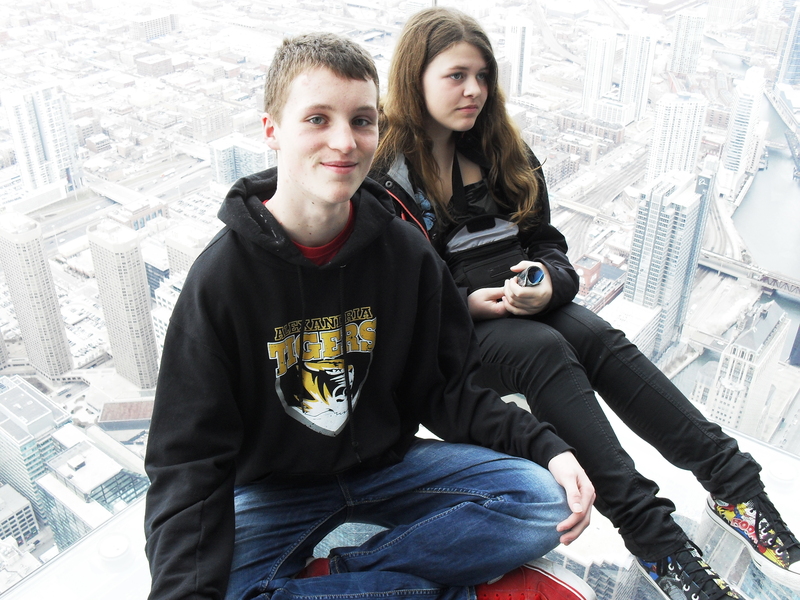 On our third and last day we were on the sky deck of the Willis Tower. We were 1,353 feet in the air and the view was great!!! 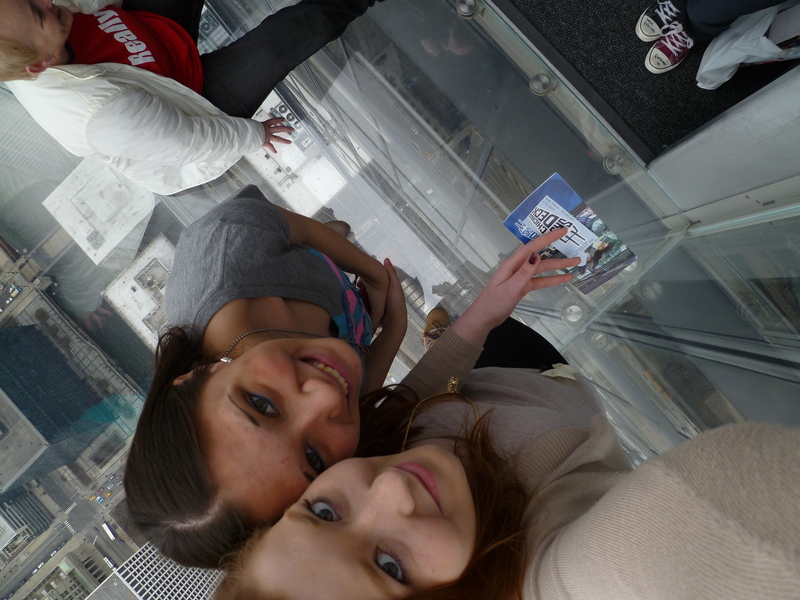 Besides there were glass boxes where you had the opportunity to walk on. When I looked down it seemed like I would fall from the building but it was really funny! 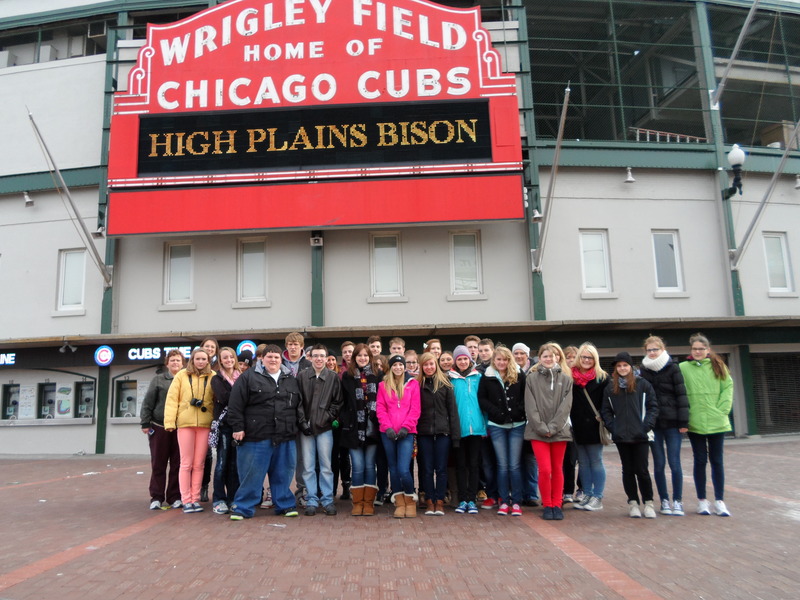 (1) In front of the Wrigley Stadium, where the Chicago Cubs baseball team plays. 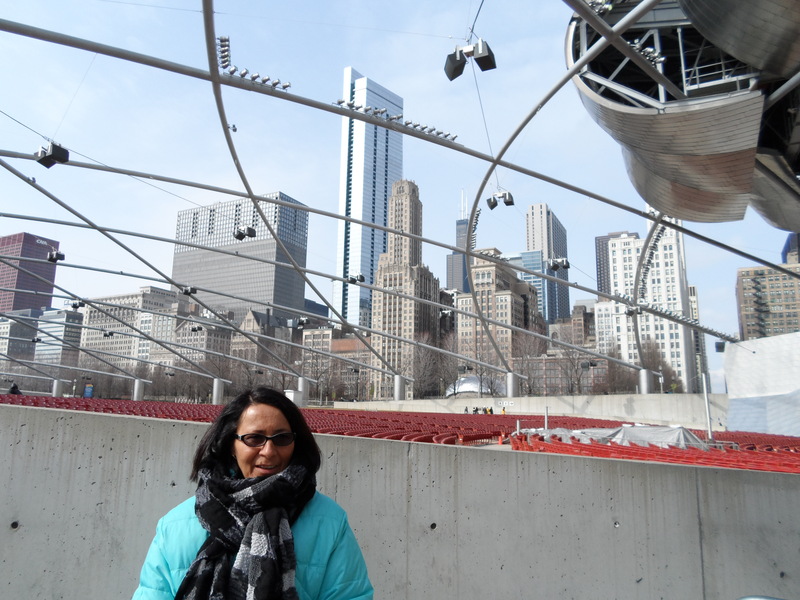 (2) Millenium Park, where there are open air performances during the summer. 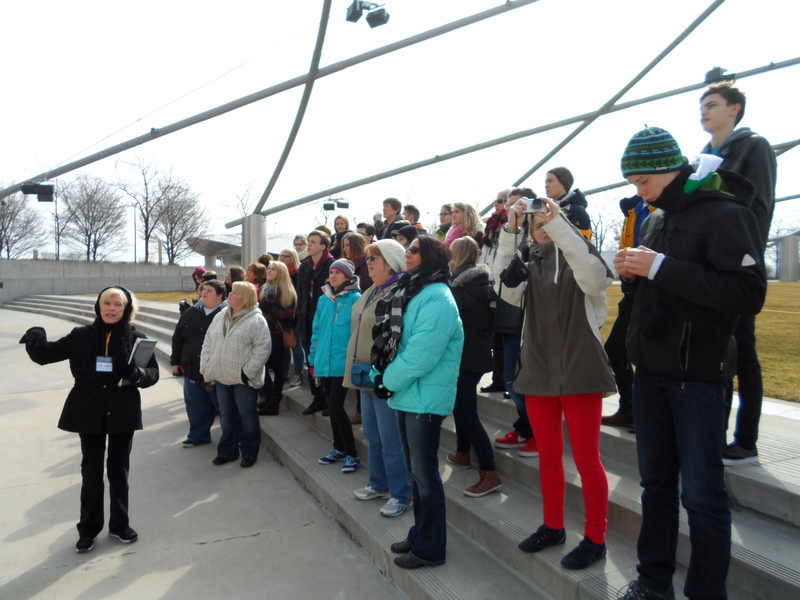 (3) Our tour guide telling us about Millenium Park. (4) „The Bean“. (5) Reflections in „The Bean“. (6) Richard. / Vor dem Wrigley Stadion, wo das Chicago Cubs Baseball Team spielt. (2) Millenium Park, wo im Sommer Open Air Veranstaltungen stattfinden. (3) Unsere Reiseleiterin, wie sie uns ueber den Millenium Park informiert. (4) Die „Bohne“. (5) Reflektionen in der „Bohne“. (6) Richard. The Willis Tower with its unforgettable view of Chicago was absolutely the highlight of our Chicago trip. The fascinating sky deck on the 103rd floor has a view into four states and up to 50 miles on a clear day. The tower is 1,730 ft / 520 m high (even taller than the Eifel tour, the Egyptian pyramids and the Empire State Building) and it’s the tallest tower in America. 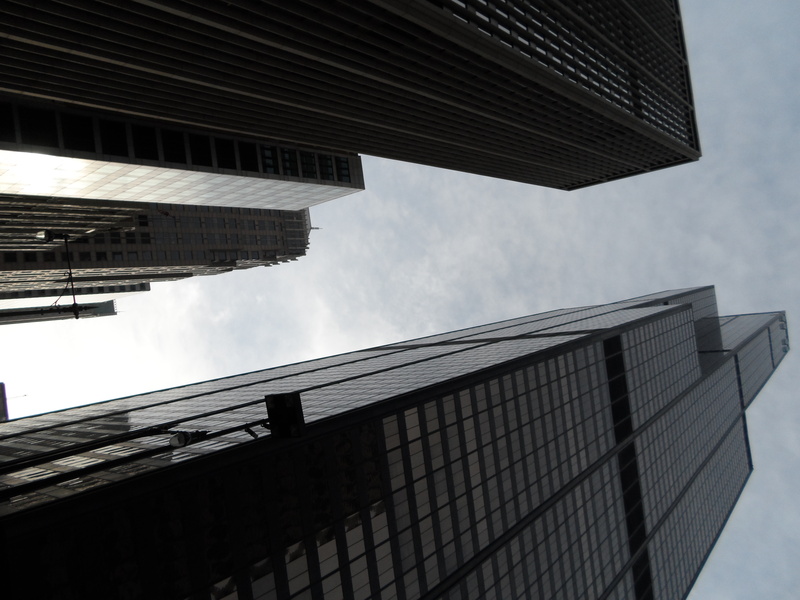 Reaching for the Sky, a fascinating 10-minute movie told us the story of Chicago’s rise to the top of the architectural world. We learnt how the tower went from dream to world icon. The skyline from this overwhelming city is scattered with the John Hancock Center, the Aon Center and the Water Tower Place. The ledge, made out of glass, was pretty scary. 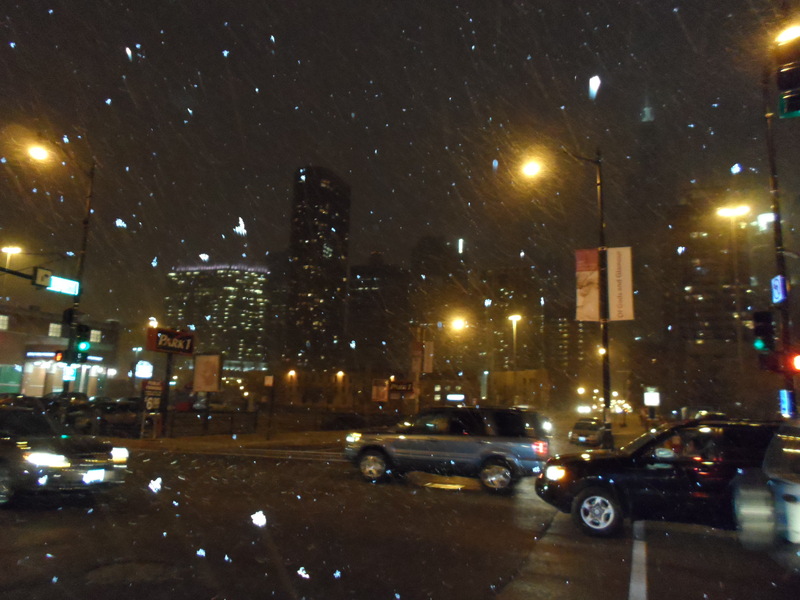 (1) Snow in Greek Town in Chicago. NOT as bad as expected and WAY less than you had in Germany. (2) Our jury for the fashion show. (3) Elisabeth and Luzie having fun despite Luzie’s handycap. 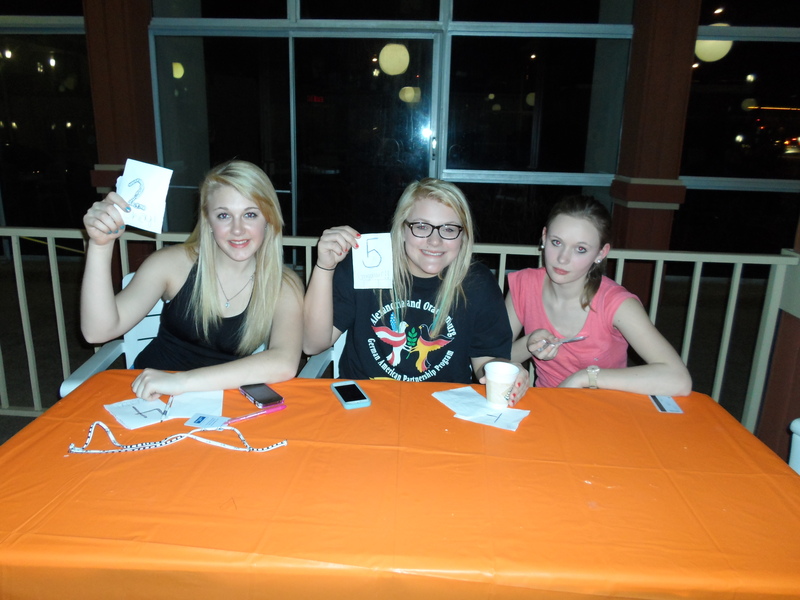 (4) Successful contestants: Lisa and Juliane. (5) Candy for the participants of the fashion show. 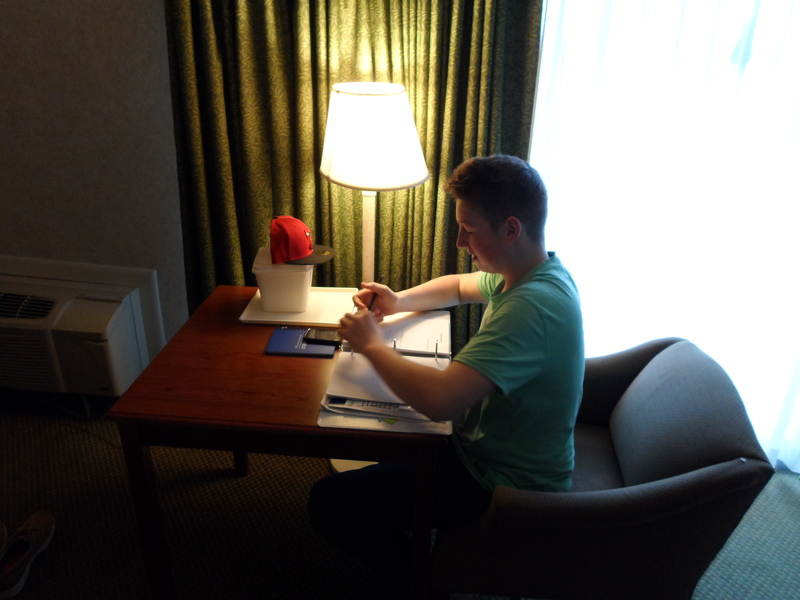 (6) Malte proving that even on vacation working on the diary is a must. / (1) Schnee in Greek Town in Chicago. NICHT so schlimm wie erwartet und VIEL weniger als in Deutschland. (2) Unsere Jury waehrend der Modenschau. 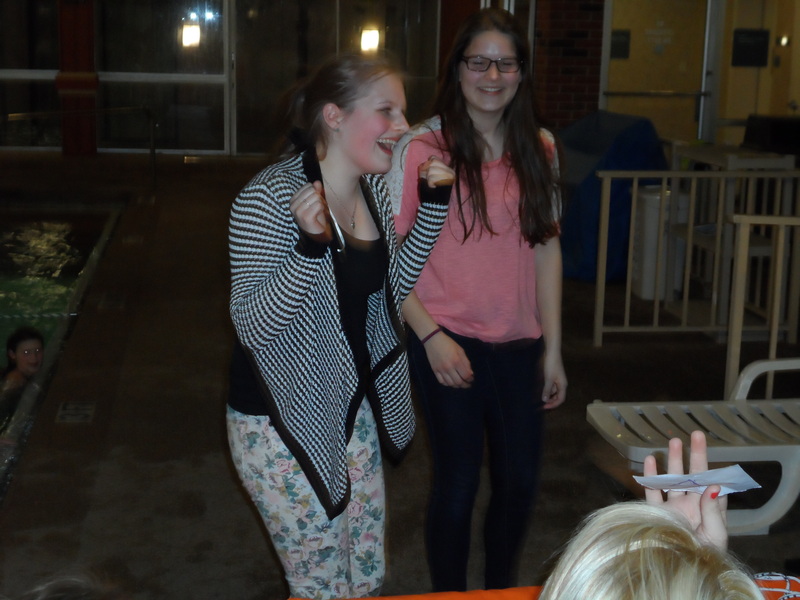 (3) Elisabeth und Luzie haben Spass trotz Luzies Handycap. (4) Erfolgreiche Kanditatinnen: Lisa und Juliane. (5) Suessigkeiten fuer die Teilnehmer der Modenschau. (6) Malte beweist, dass selbst in den Ferien die Tagebucharbeit ein Muss ist. The most impressive thing I have seen in Chicago was the Sears Tower, because for me it was very impressive how high people can build today. The view was very good, because there weren’t so many clouds. You could see the whole city with the Skyline and the Stadiums. Also visible was the Lake Michigan, which seemed more like a little Ocean. I felt a little bit worried, because I was standing a little bit far away from the ground, but the view I had made me forget that feeling. All the big high-rises and the size of the city made me feel very small and the entire view humbled me. (1) Willis Tower (right) from below. 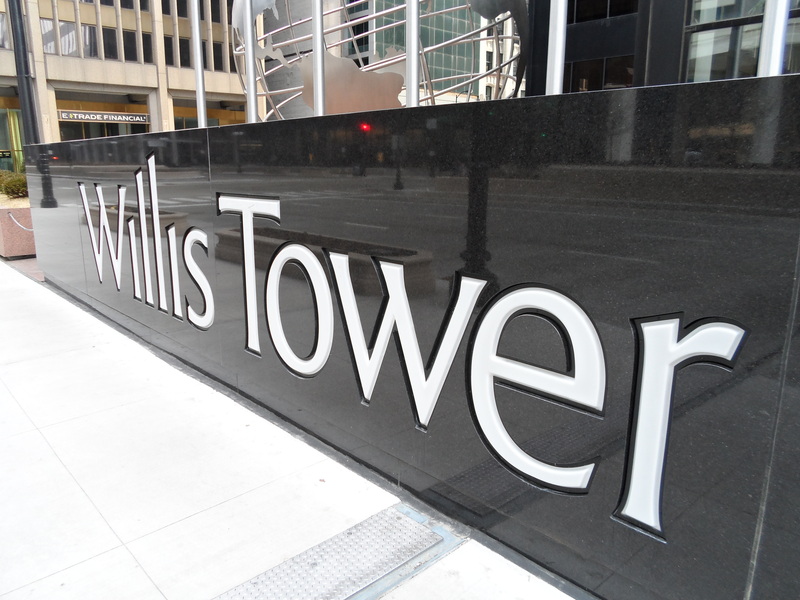 (2) Willis Tower. (3) Luise and Gina on Willis Tower. (4) View over Chicago. (5 + 6) Inside the sky box. SCARY! 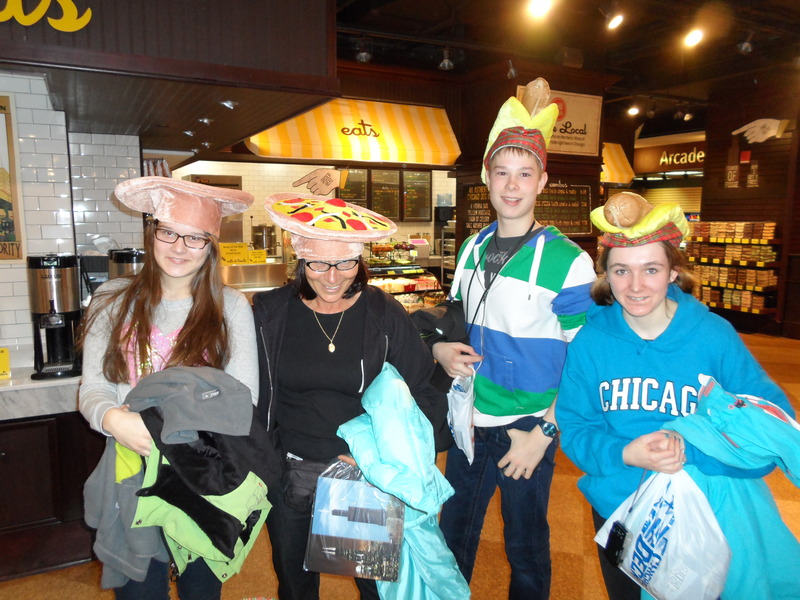 (7) The fast food gang in the Willis Tower gift shop: Elisabeth, Ms. Rohde, Thomas and Jana. 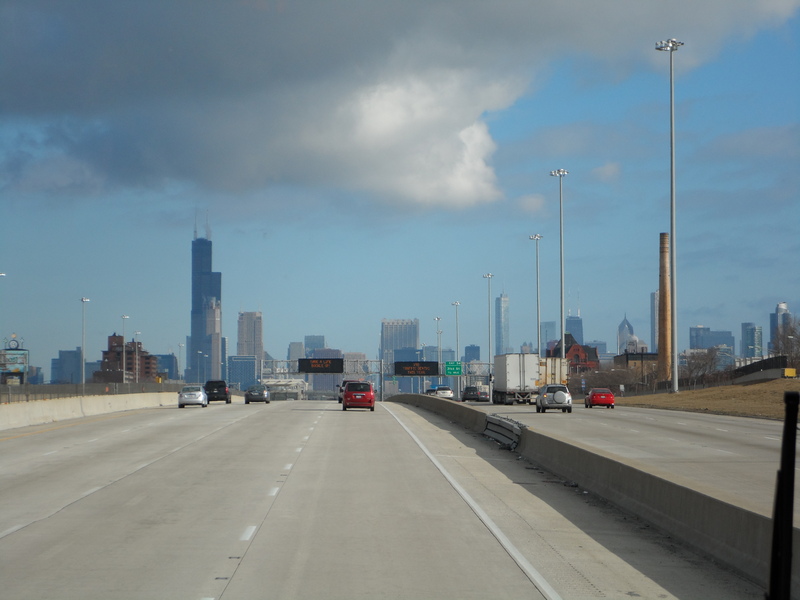 / (1) Willis Tower (rechts) von unten. (2) Willis Tower. 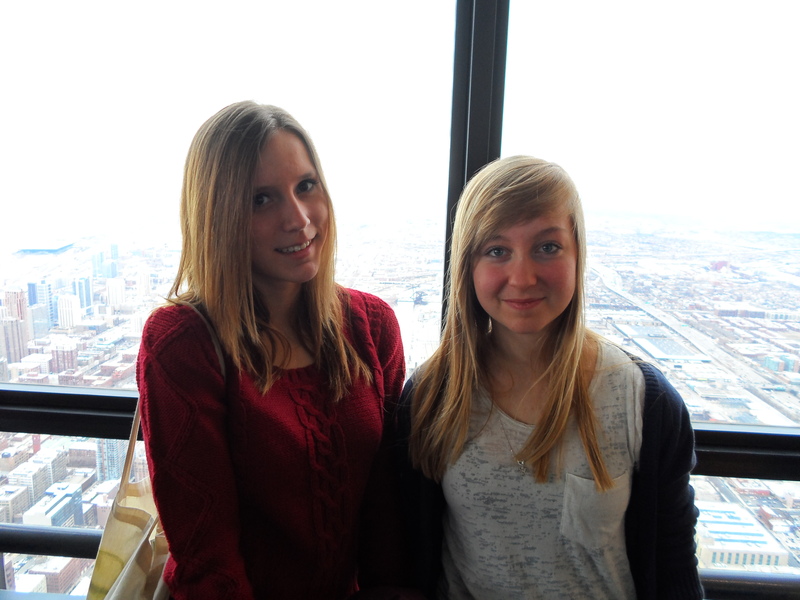 (3) Luise und Gina auf dem Willis Tower. (4) Der Blick auf Chicago. (5 + 6) In der Sky-Box. GRUSELIG. (7) Die Fast Food Gang im Willis Tower Souvenirladen: Elisabeth, Frau Rohde, Thomas und Jana. Chicago was so wonderfull. There were so many exiting things, so that I can’t tell you anything. I will tell you the things, which I think were the bests. On our third day, we were on the Willis tower. This is one of the most biggest skycrapers. From the top you can see the whole city, is was so beautiful. The best were some big glas boxes which you can go on and where you feel like you fly. After this we drove to the museum of science and indurty. It wasn’t a normal museum. You can try a lot of the things they show you so it wasn’t boring. 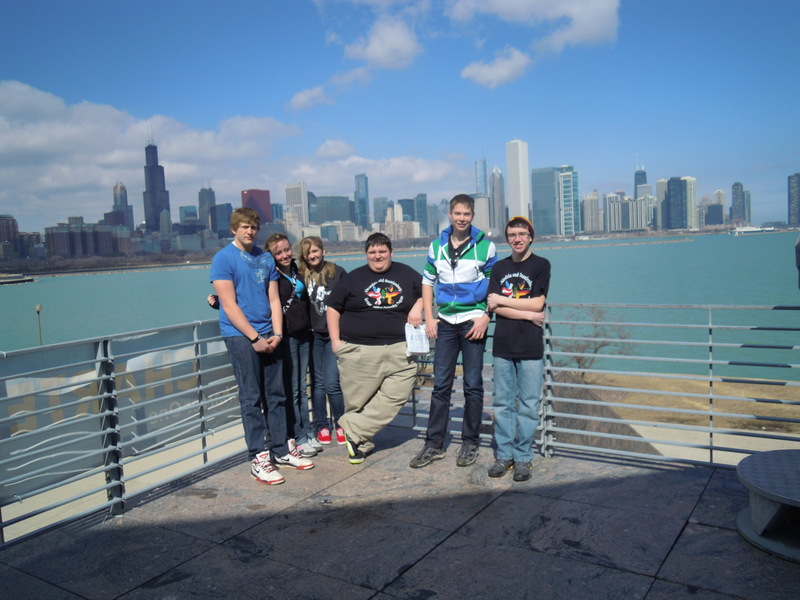 This weekend the GAPP group was in Chicago and we had a really nice time and we all had fun there. We were in an aquarium, planetarium, since museum, we did a city tour with our guide Linda, we was shopping in a huge shopping center at least we was in the Willis tower where we had a nice overview from Chicago. The best thing at these tour was the Willis Tower where saw the whole city. But I also had a bad experience because we were in an aquarium for four hours and it was so bored and it stunk a lot. But I love the whole trip because I found a lot of new friends and had a lot of fun there. After this trip I was so tired and exhausted. I also was so bad tempered cause Mrs. Solik said that we need to write and diary entry for this trip. After a 3 hour night, I was unable to get some sleep on the bus. It propably was because of the excitement, and who wouldn’t be in such a mood, going for the first time to Chicago? I had expected the weather to be freezing, but the only breath-taking thing when we got out of the bus was the city’s skyline. It lay in front of us, bright-coloured and framed by the sky with white, fluffy clouds and the Michigan lake, sparkling in the sun. For me, it was difficult to realize that we actually were in the not so windy „windy city“ as even the colours seemed surreal. After a few minutes of taking photos, enjoying the view and talking to fisherman, we got to get inside of the planetarium. Though it was interesting, I don’t think that I would have enjoyed it that much without the others. The way through the skyscrapers just didn’t seem real. Everything was bright, shiny and clean, the sidewalks were nearly empty and only a few cars passed us. Standing there, in front of the Willis tower, still commonly referred to as the Sears tower, was even in some way intimidating. After this great start, a great disappointment would follow. It seems to me, as if the favourite place to go to on a school trip is an Aquarium. I don’t want to complain about this in general, but this day, I wanted to get back out as soon as the disgusting smell reached us. For some reason, this place didn’t manage to avoid it, though every other aquuarium I had been to did. The smell ruined the nice way, in which all the fish, spiders, ducks and even monkeys were presented. If there would have been anything I really was interested in or anything I hadn’t seen before, I might have liked the endless-seeming four hours in there, but this way I just thought that it was a pity to waste such a beautifull building. My tiredness overhelmed me when we reached the hotel, and I really had to get over myself to get out of our surprisingly large room to the restaurant. The pizza we got there was surprisingly nice as well, and I’m pretty sure that not just my hunger made me like it. Sunday started with a far too sweet breakfast and weather not as nice as it had been the day before. I still really enjoyed the city tour we had afterwards, even though I didn’t really care about which celebs lived in which area and what inventions had come from Chicago. What I cared more about were the beautiful buildings, the way along the lake, which had been kept free from any buildings, all the arts (how great it must be to lead a life in one of the wealthier areas), and the fact that it seemed to be just like in the movies. I had been shopping five times before Chicago, and that might have been the reason why I wasn’t as enthusiastic as I had expected. Still, I enjoyed the three hours in the mall and the hour we spent in the Disney store. This way, I got back to the hotel happy and, for some reason, exhausted. We would be leaving on Monday, but before we headed for Alexandria, we went to the Willis tower to go up to the 103rd floor. I love heights, but even the ones who didn’t seemed to love the view over all of the great, windy city Chicago. 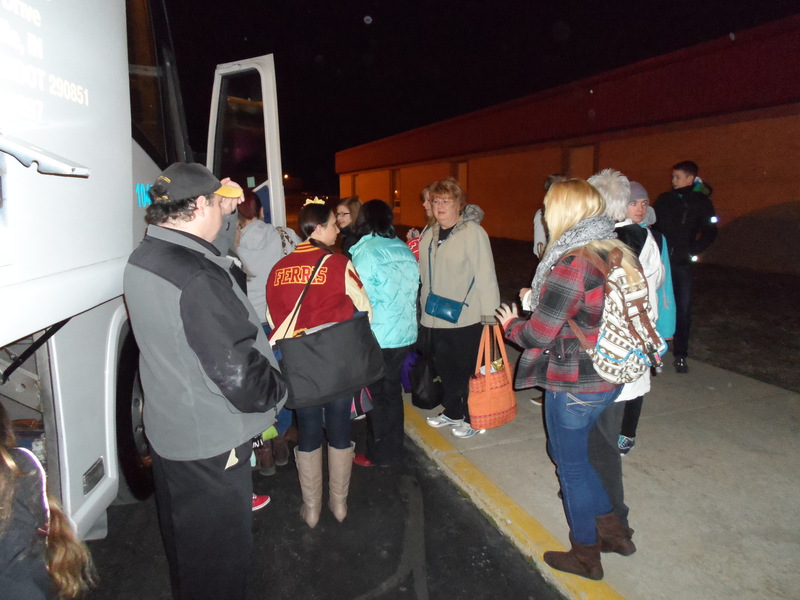 We left on Friday with a comfortable bus. 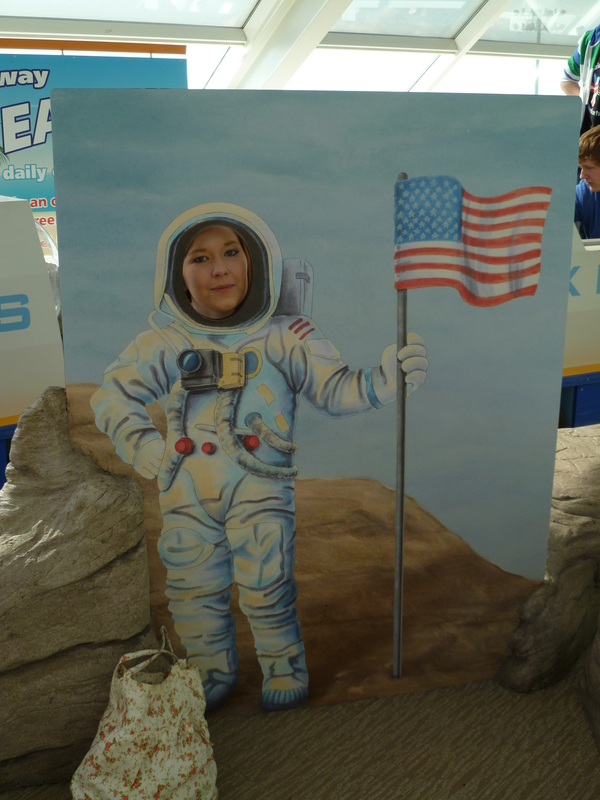 On the first day we visited the Planetarium and the Aquarium. We planned 4 h for that, but after 2h everyone was bored. The second day was better, because we started a 5 h Sightseeing Tour with our bus through the city. We left every 30 Minutes the Bus, to see the sea and the city. We shopped in little groups in a Mall with 8 floors. A good snack after that in Greek town gave us a god mood. We visited the biggest Highlight on the last day, the amazing Willis Tower. The highest building from North America. Pictures will be save this moment forever. The Museum of science and industry was a good end of this awesome trip. The first day I had to wake up early in the morning because the bus was going to leave at 6 o’clock in the morning. My host sister drove me to school in her pyjamas. When the bus drive started a lot of the students were already asleep again. But some guys were talking all the time. It was quite funny. After a few hours of driving we stopped at a parking lot where you could also buy something to eat. We went in there and found Subway. We talked a lot of rubbish on the long way to Chicago. The first stop was at the waterfront from where we could see the wonderful skyline of Chicago. It has been really cold when we went out the bus. We took a lot of photos and a “jump picture” . After that we ate lunch at the bus. Tessa and me had forget it. Ms Rohde gave us her noodle salat to eat. 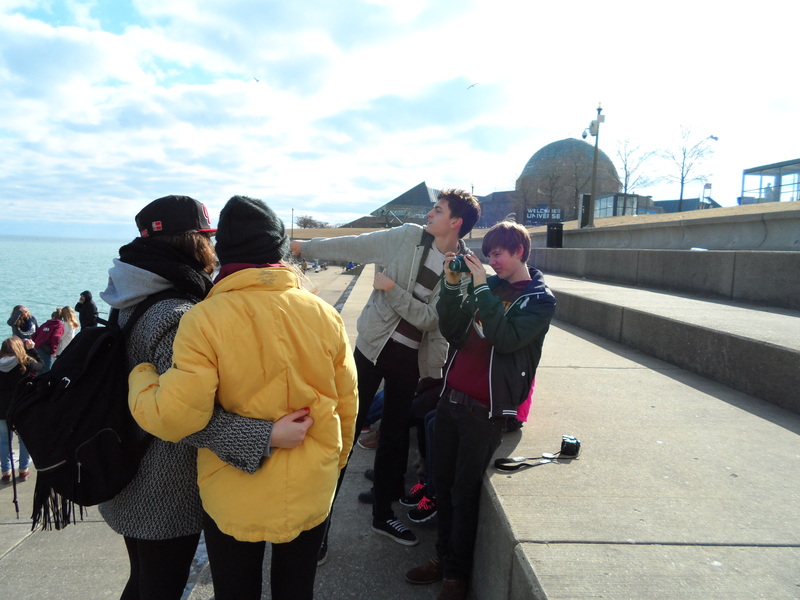 When we all were going to be ready with food, the bus driver drove us to the “Adler Planetarium” . It was interesting because it was our topic in history class too. We went to an aquarium too but it was not that interesting and the smell was terrible! 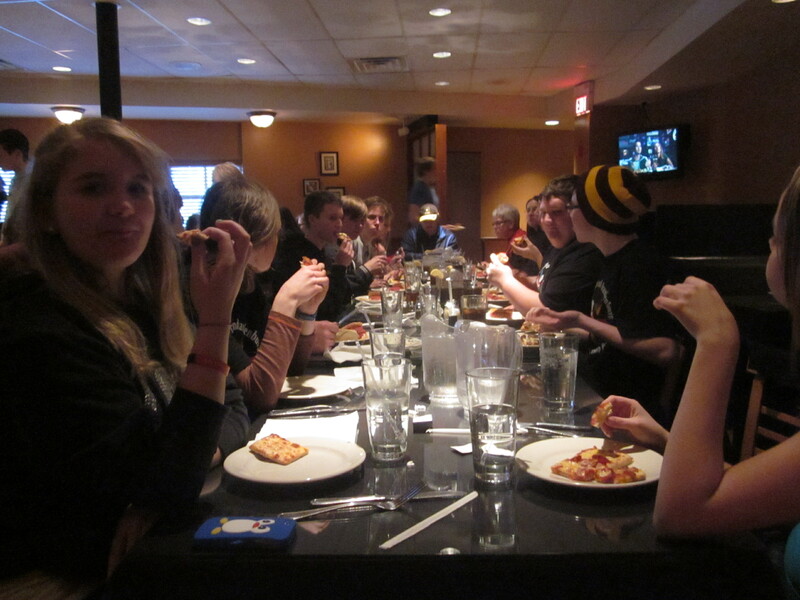 After we checked in at the hotel we went to a restaurant and ate Chicago Pizza. Almost everyone did a workout or swam (???). In the next days we went shopping and we had to do a little “catwalk show” with our new clothes at the pool. From the skydeck on the Willis Tower we had a wonderful view over Chicago. After that we drove home. We watched two movies, listened to music and thought about the wonderful weekend we had. Chicago ist ein Erlebnis für sich. Wenn man dazu die Gelegenheit hat sollte man sie auch ergreifen! 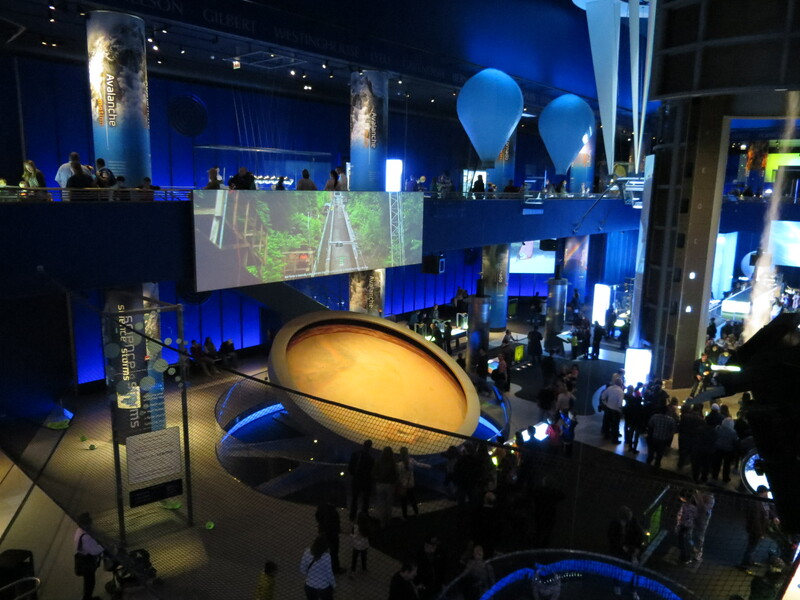 Zuerst besuchten wir das Planetarium in Chicago. Es ging in etwa um dasselbe Thema wie im Geschichtsunterricht. Seit dem weiß ich jetzt das ich 60 Mars Jahre alt bin was wirklich interessant ist. Vor dem wir uns das Planetarium ansahen haben wir Fotos von der Chicago Skyline und dem Michigan See gemacht. Nachdem wir uns das Planetarium ansahen, was im Nachhinein besser war, gingen wir in ein Aquarium und dort stank es so erbärmlich das deutsche Schüler starke Kopfschmerzen. Als Entschädigung haben wir dann echte Amerikanisch Pizza gegessen und verbrachten noch einen schönen Abend zusammen. Wir, die Schüler dachten uns das es noch viel zu früh wäre zu Bett zu gehen. Am Sonntag wurde dann schön geshoppt! Ein Traum für jede Frau 4 Stunden lang schlendern! Das war das Highlight dieses Wochenendes. Unsere Lehrer waren sehr neugierig und wollten unbedingt unsere gekauften Sachen sehen, also Veranstalteten wir eine kleine Modenshow im Hotel. Das Hotel war richtig toll mit einem Fitnessraum und einem Pool alle konnten sich ausleben. Der schönste Ausblick über Chicago…..wir waren auf dem 4. Höchsten Wolkenkratzer der Stadt und Fotographierten so viel es ging. Der Boden war aus Glas und das im 103. Stockwerk das war echt cool. Die Reise hat sich echt gelohnt und es war für jedermann was dabei. Wir genossen es echt und würden es jederzeit wieder machen. Die erste Sehenswürdigkeit, die wir in Chicago besuchten, war das „Adler Planetarium“ am Samstag. Am selben Tag waren wir in dem „Shedd Aquarium.“ Sonntag, bevor wir vier Stunden shoppen konnten, hatten wir eine Sightseeing-Tour, in der wir alle wichtigen Informationen über die verschiedenen Wolkenkratzer und anderen Gebäuden bekamen. Den „Sears (Willis) Tower“ haben wir Montag besucht. Leider habe ich Höhenangst, so dass ich die eigentlich wundervolle Aussicht auf dem Skydeck nicht sehr genießen konnte. Am Besten fand ich allerdings das „Museum of Science & Industry.“ Wir konnten uns viele physikalische Gegebenheiten anschauen & es gab viele Erfindungen, die ich noch nie zuvor gesehen hatte. Allerdings war es auch manchmal schwierig die Experimente zu verstehen, aufgrund der englischen Erklärungen. Das Interessanteste an dem Museum war für mich, dass wir die meisten Experimente sogar testen konnten. Ich wäre gerne noch länger in Chicago geblieben, um mir mehr Sehenswürdigkeiten genauer anzusehen. 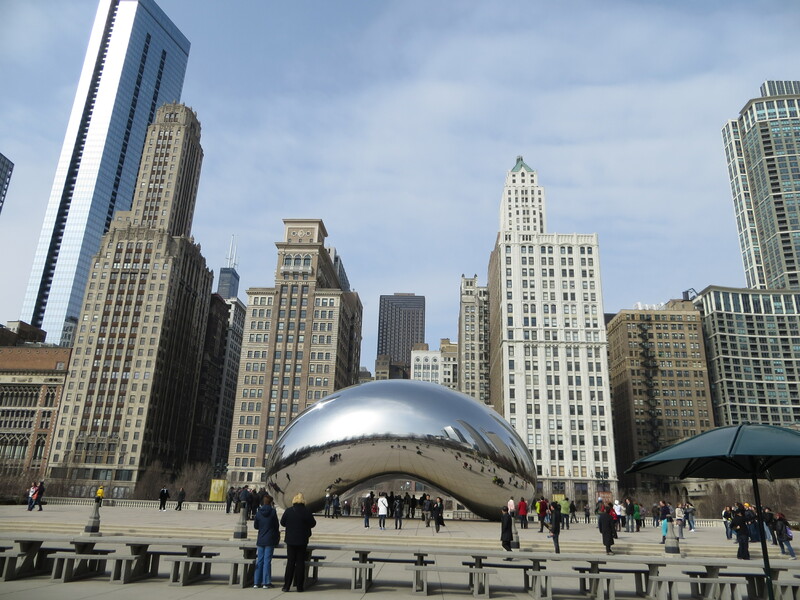 Am ersten Tag in Chicago sind wir fuer 4 Stunden ins SHEDD Aquarium gegangen. Nach einiger Zeit wurde es da ein bisschen langweilig, weil es so lang war, aber es gab ein paar wirklich interessante Sachen zu sehen, zum Beispiel die Belugawale. Ich mag Wale und das war das erste Mal, dass ich echte Belugawale gesehen habe. Darueber habe ich mich sehr gefreut. Ein anderes besonderes Tier in dem Aquarium war der Lungenfisch „Grandpa“. Er ist der aelteste Aquariumsfisch der Welt . Wir waren auch im „wild reef“. Dort konnte man Haie und viele andere Fische sehen und ich habe viele gute Fotos gemacht. Trotzdem war ich auch froh, als wir das Aquarium wieder verlassen haben, weil die Luft sehr schlecht war und ich davon ein bisschen Kopfschmerzen hatte. Meine Lieblingserlebnis in Chicago war das Abendbrot in Edwardos Pizzeria. Die deep-dish Pizza hat sooooooo gut geschmeckt. Ich war ueberrascht darueber, wie viel Belag auf solchen Pizzen ist. Die deep-dish Pizza ist typisch fuer Chicago. Ich mochte das Abendbrot in Edwardos Pizzeria gleichermassen wie auf dem Skydeck des WillisTowers zu stehen, Der Grund dafuer ist, dass ich schon einige Male auf demFernsehturm war und dessen Aussichtsplattform ist fast genauso hoch. Am 23.03 trafen wir uns vor der Schule, um mit dem Bus nach Chicago zu fahren. Die Tour war spannend, denn wir konnten miteinander quatschen und wurden durch Frau Rohde, Frau Mock und Frau Solik mit Wasser und Obst versorgt. In Chicago angekommen, forografierten wir erst einmal die Skyline. Als naechstes besuchten wir das Planetarium und anschliessend das Aquarium von Chicago. Wir sahen dort grosse und kleine Fische, wobei ich die Delfine am besten fand. Ich konnte mit Luzie sogar einen Teil von einer Delfinshow sehen. We fuhren danach zu unserem Hotel, welches nicht so hoch war, wie die anderen Wolkenkratzer in Chicago. Ich hatte einen Raum mit Malte, Halan und Devin. Wir hatten eine einzelne Tuer zu Tilman, Wil, Thomas und Janik, welche nachdem wir in einem Pizza-Restaurant gegessen haben, eine kleine Party gemacht haben. Am naechsten morgen fuhren wir mit unserem Bus zu einigen Sehenswuerdigkeiten, wie “the bean” und schauten uns die Wolkenkratzer an, welche hier in Massen waren. Nachdem wir sogar das Haus von Obama gesehen und gegessen hatten, fuhren wir zum Water Tower Place und gingen dort shoppen. Ich habe mir ein Chicago Bulls T-shirt geholt, aber nicht bei der anschliessend im Hotel stattfindenden Modenshow mitgemacht. Am naechsten Tag mussten wir unsere Sachen packen, da wir nicht mehr ins Hotel zurueckkehren wuerden. Wir stiegen auf eines der hoechsten Gebaeude der Welt, den “Willis Tower”. Von ganz oben hatte man das Gefuehl,dass man die ganze weite Welt sehen konnte, wobei es nur halb-Chicago war. Danach gingen wir ins Museum fuer Science & Industry, in dem mir am besten ein kuenstlich hergestellter Hurrikan gefallen hat. Danach fuhren wir mit dem Bus nach Hause, wo wir von unseren Host families empfangen wurden. Um 4 Uhr klingelte der Wecker. Ich freute mich sehr auf Chicago, aber in dem Moment dachte ich nur: “Bitte nicht, ich will nicht aufstehen! “. Meine Gastschwester ging nach unten ins Bad um sich fertig zu machen. Ich sagte mir “Ach, 5 Minuten kannst du ja noch mal die Augen zu machen.”. Aus den 5 Minuten wurden letztendlich 50 Minuten. Ich war so froh, dass ich Abends gepackt hatte, also machte ich mich schnell fertig und dann ging es auch schon kurz vor 6 Uhr zum Bus. Zuerst waren alle vor Aufregung hellwach, aber nach einer Weile schliefen alle. Nach 4 Stunden Busfahrt kamen wir endlich in Chicago an. Unser erster Halt in Chicago war das Adler Planetarium. Doch bevor wir rein duerften, hatten wir noch etwas Zeit. Zeit um die atemberaubende Skyline Chicagos zu sehen und zu fotografieren. Das Planetarium war sehr interessant, besonders weil man ziemlich viel selber ausprobieren konnte, wie zum Beispiel eine Weltraumsonde zu landen oder Spruenge auf dem Mond zu machen. Des Weitern war die Architektur des Gebaeudes einfach wunderschoen. Nach dem Planetarium fuhren wir zum Shedd Aquarium. Dort hatten wir sehr viel Zeit um uns alles in Ruhe anzusehen. Abends fuhren wir ins Hotel, stellten die Taschen ab und gingen auch schon zu einem Pizzarestaurant, wo es eine echte Chicagopizza gab. Das Besondere an dieser Pizza ist, dass zuerst der Kaese und der Belag auf dem Teig ist uns dann die Tomatensauce. Nun gings voll gegessen wieder ins Hotel. Kaum da, gingen die ersten schon in den Pool. Wir hatten wirklich Spass, der Pool war ziemlich gross. Irgendwann dann fiel ich einfach nur muede in mein Bett. Und schon wieder, der Wecker klingelte. Aufstehen. Nach dem Fruehstueck hiess es Sightseeing. Wir Fuhren durch ganz Chicago und sahen die beruehmtesten Gebaeude. Darunter die “Chicago Bean”, in der sich fast ganz Chicago spiegelt, den “Navy Pier”mit einem halben Freizeitpark drauf und Obamas privates Haus, das sehr stark bewacht ist. Nach 5 Stunden Stadtrundfahrt, gingen wir (endlich) shoppen. 4 Stunden hatten wir Zeit in der riesigen Mall. Wir haben sogar eine deutsche Austauschschuelerin getroffen und wirklich jeder Verkaeufer hat gefragt, wo wir herkommen und was wir hier machen. Der eine konnte sogar Deutsch, weil seine Oma in Deutschland wohnt. Die Mall war einfach toll, aber 4 Stunden waren definitiv viel zu wenig Zeit. Anschliessend fuhren wir nach Greektown fuer Dinner, jeder konnte sich aussuchen wo er essen wollte. Und wie der Name schon sagt, waren dort viele griechische Restaurants und auch ein chinesisches Restaurant “Chinese Yum Yum” und wir gingen allein schon wegen dem Namen dort hin. Dann fuhren wir alle erschoepft ins Hotel. Die meisten gingen wieder in den Pool, die anderen mussten eine ziemlich peinliche Modenschau hinter sich bringen mit den Sachen die sie sich gekauft hatten. Ich durfte auch mitmachen und da ich mich in der Mall verletzt hatte, humpelte ich ueber dem Laufsteg. Es war so genial. Dann ging’s auch schon ins Bett. Am naechsten Tag nach dem Fruehstueck packten wir unsere Taschen und machten uns auf zum hoechsten Gebaeude in Chicago, dem Willis Tower. Der Willis Tower ist vom Boden bis zur Spitze 527,3 Meter hoch. In einer Hoehe von 412 Metern, im Stock 103 liegt das Skydeck mit den beruehmten Glasbalkonen. Von dort aus kann man ganz Chicago sehen und wenn man Glueck mit dem Wetter hat, kann man bis zu 80 Kilometer weit sehen. Wir hatten leider nicht so viel Glueck, aber trotzdem war die Aussicht einfach ueberwaeltigent und zugleich angsteinfloessend. Man stand wirklich nur auf Glas und 412 Meter unter einem fuhren Autos und Busse. Da das Wetter nich ganz so gut war, gingen wir ins “Museum of Science and Industry” (nsonsten waeren wir zu den “Indiana Dunes” gefahren). Das Museum war sehr, sehr interessant. Man haette dort wirklich einen ganzen Tag verbringen koennen, ich glaube nicht mal dann haette man alles gesehen und wir hatten nur 2-einhalb Stunden. Nach dem anstrengenden Tag ging es dann wieder nach Hause. Um 19:45 Uhr erreichten wir die Highschool, wo unsere Gastfamilien schon warteten. Chicago ist wirklich eine der schoensten Staedte, die ich je gesehen hab. Ich war total aufgeregt nach Chicago zu fahren! Es hört sich komisch an aber ich habe mich am meisten auf das hellblaue Wasser gefreut! Als wir angekommen sind, waren wir direkt am Michigan See und ich war echt überwältigt, weil ich noch nie zuvor so wundervolles Wasser gesehen habe! Das absolute Highlight war fuer mich der Willis Turm mit einem unvergesslichem Ausblick auf Chicago. Das faszinierende Himmeldeck auf dem 103. Stock hat eine Aussicht in 4 Staaten und bis zu 50 Meilen an klaren Tagen. Der Turm ist 1,730 feet (fuss) / 520 Meter hoch (hiermit ist er sogar hoeher als der Eifelturm, die aegyptischen Pyramiden und das Empire Sate Building) und ist der hoehste Turm in Amerika. Als wir oben angekommen sind, hat uns ein 10 minuetiger Film die Geschichte und den Aufstieg des Turms bis an die Spitze der weltbesten Archetiktur erlaeurtet. Wir lernten, wie er vom Traum zu einer Welticon wurde. Die Skyline von dieser atemberaubenden Stadt besteht aus: dem John Hancock Center, dem Aon Center und dem Water Tour Place. Die glaesserne Terasse (der Boden ist auch aus Glas) war sehr gruselig. Das faszinierendste an Chicago war der Willis Tower, weil es sehr beeindruckend für mich war was Menschen heut zu Tage bauen können. Die Sicht war sehr gut, weil es nicht viele Wolken gab. Man konnte die gesamte Skyline und die verschiedenen Stadien sehen. Außerdem war der Michigansee sichtbar, der schon eher wie ein kleiner Ozean scheint. I war ein wenig beunruhigt, weil ich so weit war, aber die Sicht die ich hatte ließ mich diese Gedanken vergessen. Ich fühlte mich ziemlich klein zwischen all den Wolkenkratzern und in der Großstadt. und so hat das ganze viel mehr Spaß gemacht, als in einem normalen Museum. Dieses Wochenende waren wir mit der GAPP Gruppe in Chicago und hatten eine gute Zeit und hatte alle sehr viel Spass. 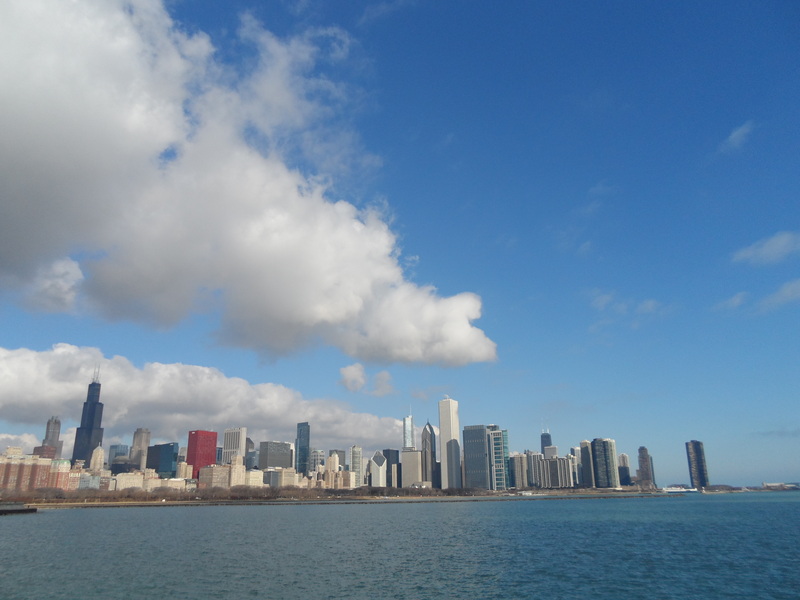 Wir waren im Aquarium, Planetarium, wir hatten eine City tour mit unserer Fuehrerin Linda, wir waren in einem grossen Shopping Center und waren im hoechsten Turm, den Willis Tower. Das beste an der ganzen tour war der Willis Tower, weil wir eine genial Aussicht hatten und die ganze stadt sehen konnten. Aber Ich hatte auch eine sehr schlechte Erfahrung im Aquarium, weil es sehr langweilig war und alle schon im Aquarium waren und es so fuerchterlich gestunken hat. Nach diesem Trip war ich sehr muede und erschoepft. Ich war auch sehr schlecht gelaunt als Frau Solik sagte das wir alle einen Bericht ueber dieses Ereignis schreiben sollten. Nach einer kurzen Nacht konnte ich auch im Bus keinen Schlaf finden. Wahrscheinlich war es wegen der Aufregung, und wer wäre nicht so gespannt, zum ersten Mal auf dem Weg nach Chicago? Ich hatte erwartet, dass das Wetterfurchtbar kalt sein würde, doch die einzige atemberaubende Sache, als wir aus dem Bus kamen,war die Skyline der Stadt. Sie lag vor uns, in leuchtenden Farben, umrahmt vom Himmel mit weißen, fluffigen Wolken und dem Michigan See, in der Sonne glitzernd. Es war schwer für mich zu realisieren, dass wir wirklich in der nicht ganz so windigen „windy city“ waren, da selbst die Farben unwirklich schienen. Nach ein paar Minuten Photos machen, den Ausblick genießen und mit Fischern reden konnten wir in das Planetarium gehen. Obwohl es intrressant war, glaube ich nicht, dass es mir auch ohne die anderen so gefallen hätte. Der Weg zwischen den Wolkrnkratzern schirn einfach nicht real. Alles war, hell, glänzend und sauber, die Gehwege waren fast leer und nur wenige Autos fuhren an uns vorbei. Dort zu stehen, vor dem Willis Tower, welchen die meisten Leute noch immer Sears Tower nennen, war sogar etwas einschüchternd. Auf diesen großen Start würde eine große Enttäuschung folgen. Ich habe den Eindruck, dass due meisten Schulausflüge zu Aquarien sind. Im Allgemeinen möchte ich mich darüber nicht beschweren, doch an diesem Tag wollte ich wieder gehen, sobald uns der ekelhafte Gestank erreichte. Aus irgendeinem Grund schaffte dieser Platz es nicht, ihn zu vermeiden, obwohl jedes andere Aquarium, in dem ich je gewesen bin, es konnte. Der Gestank ruinierte die schöne Art und Weise, in der all die Fische, Spinnen, Enten und sogar Affen präsentiert wurden. Hätte es dort etwas gegeben, in dass mich wirklich interesiert oder das ich noch nie gesehen hatte, hätten mir die vier nicht enden wollenden Stunden vielleicht gefallen, doch so konnte ich nur die Verschwendung des wunderschönen Gebäudes bedauern. Müdigkeit überkam mich, als wir das Hotel erreichten, und es war eine echte Überwindung für mich, aus unserem überraschend großen Zimmer in das Restaurant zu gehen. Auch die Pizza dort war überraschend gut, und ich bin mir sicher, dass ich sie nicht nur wegen meines Hungers mochte. Sonntag begann mit einem viel zu süßen Frühstück und Wetter, das nicht ganz so schön wie das vom vorherigen Tag war. Trotzdem gefiel mir die Stadttour danach sehr gut, obwohl es mich nicht besonders interrssierte, welche berühmten Persönlichkeiten in welchem Haus lebten, oder welche Erfindungen aus Chicago kommen. Was mich mehr faszinierte waren die wunderschönen Gebäude, der Weg entlang des Sees, der frei von Gebäuden war, all die Kunstwerke (wie toll es sein muss, in einer der wohlhabenderen Gegenden zu leben), und der Fakt, dass alles wie in den Filmen zu sein schien. Ich bin vor Chicago schon fünf mal Shoppen gewesen, was vielleicht der Grund war, warum ich nicht ganz so enthusiastisch gewesen bin, wie ich es erwartet hatte. Und trotzdem, ich mochte die drei Stunden in der Mall und die Stunde, die wir in der Disney Store verbracht haben. So kam ich glücklich zurück ins Hotel, aus irgendeinem Grund erschöpft. Am Montag machten wir uns auf den Rückweg, doch bevor wir nach Alexandria fuhren, ging es zum Willis Tower hoch zum 103 Stock. Ich liebe Höhen, aber selbst die, denen es nicht geht schienen den Blick über die großartige Stadt Chicago zu genießen. Am Freitag ging es gegen 6 Uhr mit einem komfortablen Reisebus fuer die GAPP Gruppe und einigen Host Geschwistern nach Chicago los. Alle hatten sich Essen mitgenommen, da der Bus nur eine 15 Minuten Pause eingeplant hatte. Nach knapp 4 h erreichten wir Chicago und konnten uns von der einzigartigen Skyline ueberzeugen. Im Planetarium waren wir 2h, was uns genug Zeit gab die Phaenomene des Universums Detailgenau zu betrachten. Nach dem Mittagessen im Bus betrachteten wir 4 h die Einzigartigkeit des Meeres. Besonders gelungen war die Delphinshow, bei der Beluga Wale ihr koennen zeigten. Abgesehen vom Geruch war das Sheddaquarium ein einmaliges Erlebniss. Nach einer leckeren Pizza und einen gemuetlichen Abend schliefen wir alle um 22 Uhr ein. Der naechste Tag begonn mit einer 5 stuendigen Guide Tour, bei der uns eine aeltere Frau alle Einzelhiten ueber Chicago erzaehlte. Dieses Gefuehl inmitten der Skyline und dch so nah zum Michigan See war unglaublich. Wir begannen nach der Tour im Water Tower Place in keineren Gruppen 4 h zu shoppen. Fast jeder fand etwas in dieser riesigen Mall, die viel groesser als das Alexa war. Die eingekauften Sachen wurden am Abend in einer kleinen Modeschau am Pool gezeigt. Am Abend konnte jeder in den Genuss Griechischer Spezialitaeten kommen, da der Bus 1,5h halt im Griechischen Viertel machte. Der letzte Tag beinhaltete das groesste Highlight, den Willis Tower. Der hoechste Tower Nordamerikas bietete einen aussergewoehnlichen Blick ueber die fast 3 Millionen Einwohner fassende Metropole. Den Abschluss brachte das Technikmuseum, indem jeder Hautnah die Entwicklung der Technik erleben konnte, wobei viele Stuecke aus dem zweiten Weltkrieg stammten und wir unsere Deutschkenntnisse bei den Aufschriften beweisen konnten. Leider hatten wir dafuer nur 2h, da kurz darauf schon die ernuechternde Heimfahrt auf uns wartete.